In the late 80s, my family immigrated to the United States. It was the beginning of my 7th grade year and still stand out in my memory as a lonely and difficult time. Two spaces became havens for me: the middle school choir room and the school library. It is no wonder that I eventually became a music teacher and then a school librarian – that is how powerful of an impact a welcoming educator can make on a child. In previous blog posts, BACC bloggers focused on creating a collection that reflects cultural and global diversity. To close out this month’s topic, I’d like to focus on a group of children who are not always welcomed or reflected in our collections. In early December, Judi Moreillon introduced our focus for the month-diversity and inclusion in school library programs. She shared a number of excellent resources for building school library collections that support the cultural background and interests of students, and also represent perspectives from the broader global world through literature. 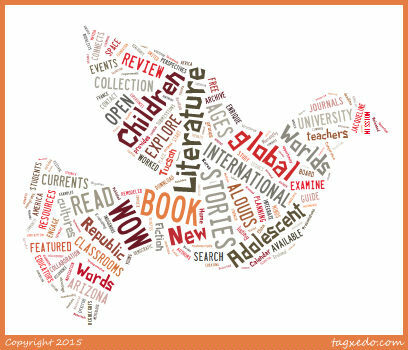 Global literature provides a platform for understanding the humanity that connects all cultures. 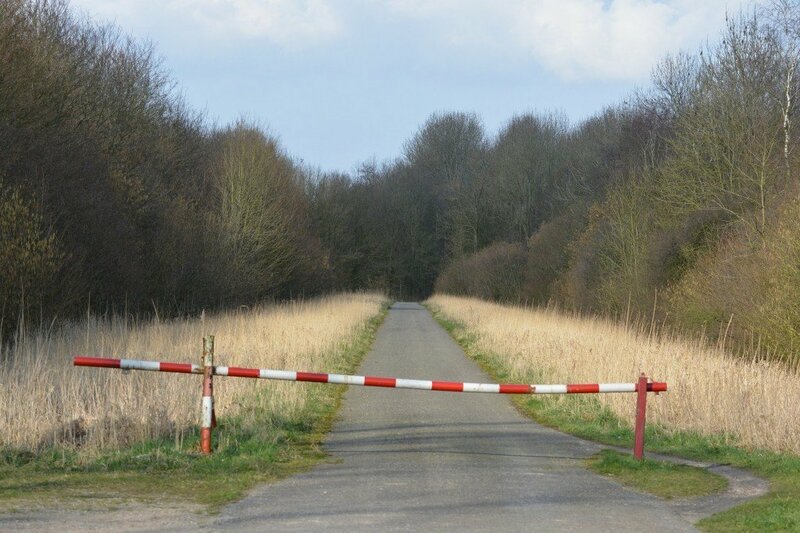 Last week Karla Collins reminded us in her post that we have to recognize and remove barriers that inhibit equitable access to resources and school library learning spaces for a range of diverse learners. We need to look at our spaces and collections with fresh eyes as the student demographics continue to change in our schools, if indeed, we are to transform learning for all who come through our doors. Let us reflect on the wonder and possibility of our educational system that is open to all, and to celebrate the opportunities that exist for the future. Every school is unique, and reflects the hopes and dreams of the local community, from rural areas to suburban and urban neighborhoods. “It takes a whole village to raise a child,” comes from an African proverb, meaning that a child’s upbringing, or education, is the responsibility of the community, and the message is even more relevant in contemporary times. Continuing with the December theme, I invite you to come along with me to visit a school here in Northern Vermont to see what diversity and inclusion in a school library looks like here. C.P. Smith School is a Grades K-5 school of approximately 260 students, located in a Burlington neighborhood that represents a cross section of learners from diverse cultural and and economic backgrounds. Burlington and the surrounding area have welcomed new immigrants and refugees for many years, and at least 40 different languages are spoken in homes throughout the city. Students and their families are welcomed in the schools, and have achieved academic success over time. Since 1959, we have worked hard to build a learning community that is respectful, responsible, and safe for all who come through our doors. We believe we offer equal amounts of academic rigor and joy, as numerous activities and events occur throughout the year at the classroom and whole-school levels to celebrate learning across cultures. We serve a diverse population of students and strive to make sure each one becomes an inquisitive learner and contributing citizen. We engage parents and guardians as vital partners in the education of their children and actively seek ways to reach out to the larger community, as well. 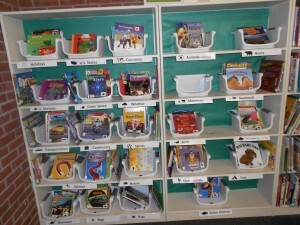 The Ellie B. McNamara School Library reflects that mission also, and it is a hub of classroom and school wide activities. 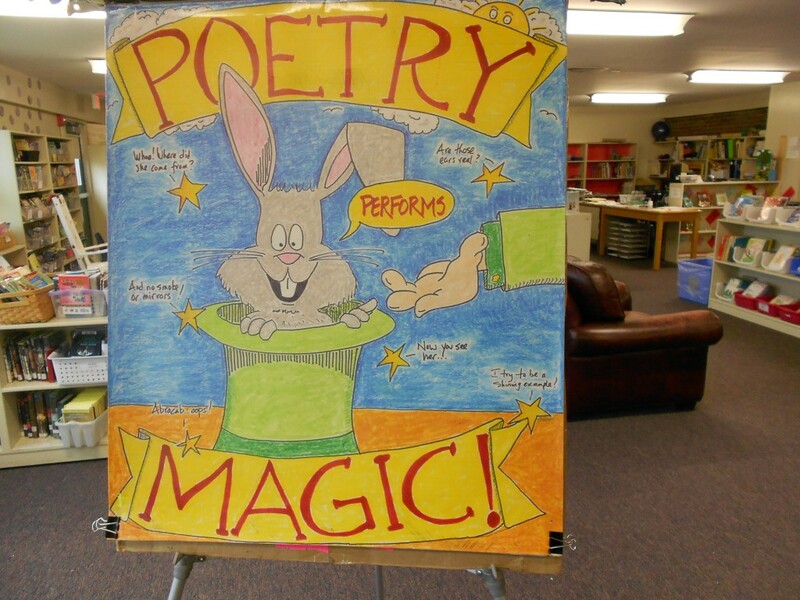 On the day I visited, Sharon Hayes, the Library Media Specialist/Tech Integrationist had helped organize a poetry residency with the poet Ted Scheu. He was leading poetry workshops in classrooms all day, and lunching with poets in the library. Parents volunteers were helping with activities. 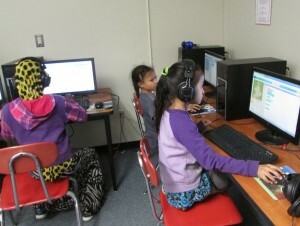 In the meantime, the computer lab was buzzing with groups of students jazzed with the Hour of Code activities that Sharon had planned. The flexible learning space in the library accommodated varied visitors, from students looking for reading books to parents chatting at a table in a corner. The collection has been genrefied somewhat to reflect the range of reading levels and interests of students who come from a variety of cultures and backgrounds. Sharon asks for student and teacher input for building the collection. 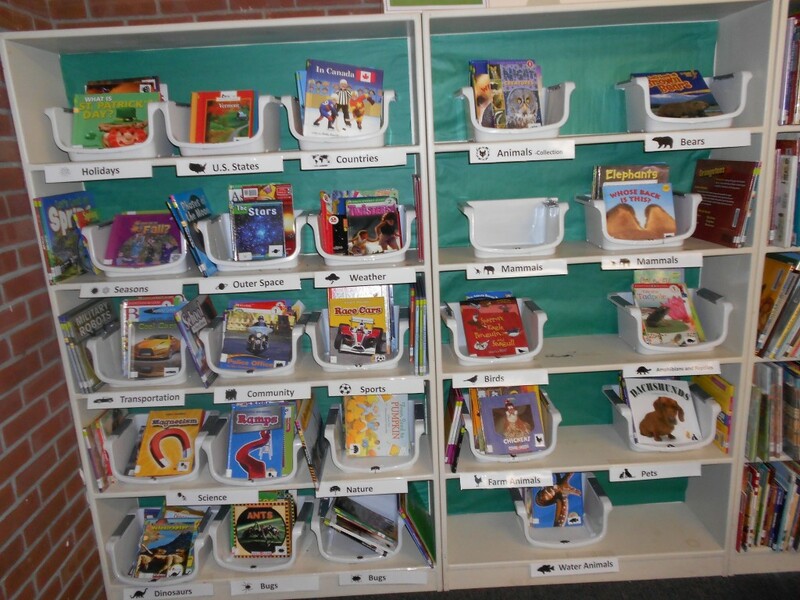 Novice readers can access nonfiction books in baskets that have visual clues for topics such as animals, weather, and so on. Signage helps students find favorite authors and series books. A set of Chromebooks are new to the school, and Sharon is looking to expand access to technology for students who might not have access to computers at home. Some children have multiple devices, and some have few, or none. Ereaders are desirable for students who are working to improve reading skills, and they provide privacy for students. Equitable access to technology is critical for all, and schools must fill that need, so Sharon is writing grants to increase capacity for her students. Sharon enjoys the diversity of the students, and her goal is for them to be independent and successful readers and learners. She encourages them to turn to each other for help, to be problem solvers, and to take risks and make mistakes. The library space is an integral spot for learning after school also. The after school program is welcome to use the facility and the resources, and it provides a safe and comfortable place for children who have to stay until parents are finished with the workday. It is truly a space that reflects the community values of the school. As I left for the day, the principal came out to say farewell and to be sure to come again. I’m sure I will, too. “C.P.Smith Elementary School.” C.P.Smith Elementary School – Index. 2015. Web. 18 Dec. 2015. <http://smith.bsdvt.org/>. Hayes, Sharon. “Welcome to Our Library.” Ellie B. McNamara Memorial Library. 2015. Web. 18 Dec. 2015. <http://cpsmithschoollibrary.blogspot.com/>. Healey, Rev. Joseph G., M.M. “African Proverb of the Month, Nov. 1998: ‘It Takes a Whole Village to Raise a Child.’ “ 2015. Web. 18 Dec. 2015. <http://www.afriprov.org/african-proverb-of-the-month/23-1998proverbs/137-november-1998-proverb.html>.